• Be weather wise. Sudden wind shifts, lightning flashes and choppy water all can mean a storm is brewing. Bring a portable radio to check weather reports. • Bring extra gear you may need; a flashlight, extra batteries, matches, a map of where you are, flares, sun tan lotion, first aid kit, and extra sunglasses. Put those that need to be protected in a watertight pouch or a container that floats. • Tell someone where you’re going, who is with you, and how long you’ll be away. Then check your boat, equipment, boat balance, engine and fuel supply before leaving. • Learn to swim. The best thing anyone can do to stay safe in and around the water is to learn to swim. 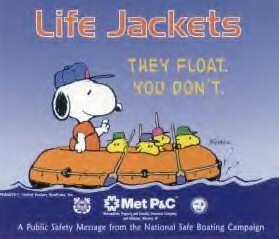 This includes anyone participating in any boating activity. • Alcohol and boating don’t mix. Alcohol impairs your judgment, balance, and coordination — over 50 percent of drownings result from boating incidents involving alcohol. For the same reasons it is dangerous to operate an automobile while under the influence of alcohol, people should not operate a boat while drinking alcohol.